One morning in late May, in an auditorium at the University of Oslo, Robert Langlands, one of the most influential mathematicians in the world, delivered a lecture to a crowd of distinguished colleagues. They had gathered to mark the eighty-one-year-old’s receipt of the Abel Prize—what many consider the equivalent of the Nobel Prize for mathematics. For the relatively sedate world of academia, this was the equivalent of an acclaimed director accepting an Oscar for best movie only to take the stage and lambaste the movie’s sequel, directed by someone else. 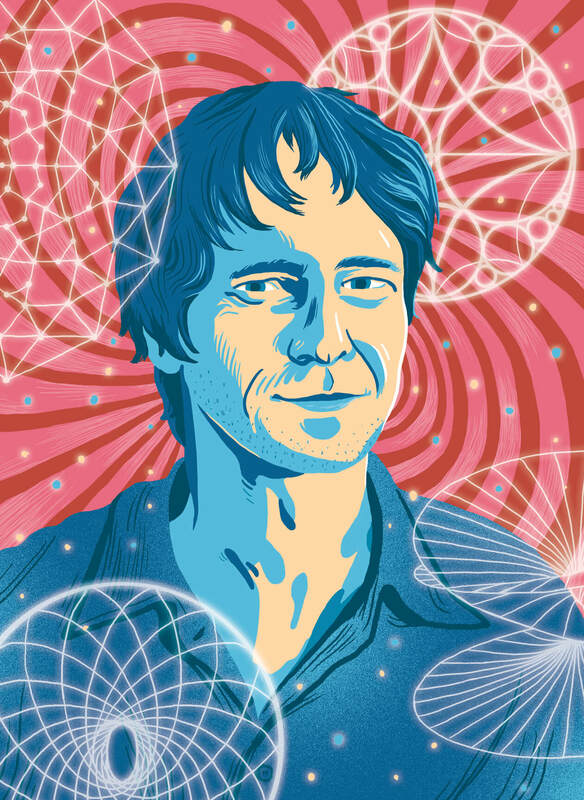 Near the front of the auditorium sat a man named Edward Frenkel—a Russian-born, California-based mathematician who has spent much of his career expanding on and popularizing Langlands’s work. In the 1960s, Langlands discovered a relationship between two fields generally considered to be separate: number theory (the study of integers) and harmonic analysis (the study of continuous phenomena such as waves made by the oscillation of a guitar string). His work—which established a strong and unexpected bridge between the realm of whole numbers and the realm of continuous functions—created the possibility for a new way of thinking about connections in mathematics altogether. Langlands’s observations are so significant they have inspired hundreds of scholars, many of whom have spent their careers refining and proving them, and launched whole new areas of research. One of these new fields—in which Frenkel is a leading scholar—expands upon Langlands’s original observations by extending them to geometry, which, in turn, introduces the possibility of applications in other disciplines. Together, the various lines of investigation (the so-called classic Langlands Program and the expanded geometric and physical Langlands programs) comprise one of the most ambitious mathematical research projects in existence—one over which Langlands himself has no control. The gap between Langlands and Frenkel, who teaches at the University of California, Berkeley, is shaped by their different technical approaches to pure mathematics and also by their motivations: some of Frenkel’s work deals with the potential “usefulness” of mathematics, which Langlands isn’t so concerned with. This is most apparent in applications of the geometric (but not the classic) Langlands Program to theoretical physics—which, with its captivating notions of space-time exploration and quest to understand the building blocks of the universe, can capture the imagination more than esoteric mathematical initiatives do. The two mathematicians have also come to symbolize a greater chasm in the academic realm: the difference between fiddling with abstract concepts for the pure enjoyment of the exercise and doing it to solve concrete problems in the real world . As universities shift away from their traditional role as centres for pure research and increasingly favour more pragmatic and applied disciplines (less philosophy, more engineering), the question of what purpose mathematics serves—or whether it needs to serve one—has very real consequences for its practitioners. Against this backdrop, the various interpretations of the Langlands programs have become a case study for debates about the justification of abstract science. In 2013, Canada’s then minister of science and technology, Gary Goodyear, told the CBC that his department was asking scientists to “appreciate the business side of science. . . . Knowledge that is not taken off the shelf and put into our factories is actually of no value.” And so, says Michael Harris, an American number theorist, pure mathematicians sometimes participate in a collective myth to secure their survival: they speak about their research as imminently applicable. The pressure many mathematicians feel to make the results of their research either as romantic as black holes or as practical as stock brokerage has begun to rid that research of its freedom. Frenkel, whose looks inspired one newspaper to call him “the world’s sexiest spokesman for mathematics,” is a much more natural emissary to the outside world: he has a soft voice that inspires comfort, and he tends to tell his audiences that they have good “energy,” that mathematicians are a “family,” that he speaks “from the heart.” In 2013, Frenkel published a bestselling general-interest book about mathematics called Love & Math: The Heart of Hidden Reality. The book tells the story of Frenkel’s life as a young Jewish man in Moscow, and it explains, in (relatively) simple terms, the Langlands Program and Frenkel’s own work on it. In the book, Frenkel uses familiar metaphors to coax his readers into the world of math: finding irrational numbers is like adding cubes of sugar to a cup of tea; quantum duality is like the relationship between potatoes and onions in his mother’s borscht recipe; the Langlands Program is like a giant jigsaw puzzle. Frenkel has written columns for the New York Times and has been a guest on the Colbert Report. He costarred in his own semierotic movie about the beauty of mathematics, and he is prone to telling reporters things like “I will show you the ecstasy of mathematics.” So when a journalist writes about the Langlands Program, they generally don’t interview Langlands; they interview Frenkel. “Mathematicians have miserably failed, as a profession, in terms of communicating with the general audience,” says Frenkel. “But also within mathematics we fail completely in communicating with each other. . . . In my mind, it’s our obligation to share.” Langlands is not much inclined to this kind of sales effort. That kind of engagement with the philosophical underpinnings of mathematics is less common now, and today even some pure mathematicians will talk readily about practical extensions of their work. Those who are interested in computer science or theoretical physics, for instance, also argue that while the abstract might not be immediately applicable, it will almost always develop into something useful—in the same way that non-Euclidean geometry eventually helped Einstein develop his theory of general relativity and number theory is now instrumental to password security. In the 1980s, mathematicians around the world, including Frenkel, started working on the geometric Langlands Program: a related but parallel field of study that explores some applications of Langlands’s findings. Geometry and number theory had long been considered separate disciplines: geometry comes mostly from the Greek tradition, while algebra originated largely in the Middle East during the golden age of Islam. Even after René Descartes famously merged the two subjects in his 1637 La Géométrie, they rarely overlapped: algebra was considered a pure subject, while geometry, because of its various practical uses, was often treated as a kind of “mixed” pursuit—what we would now call applied mathematics. A variety of connections between geometry and number theory have developed since, but few are as extensive as what the geometric Langlands Program is hoping to construct. The expansion of the geometric program also paralleled many developments in the world of theoretical physics, which sets out to explain the most fundamental particles and forces in nature; in part because of this progress, physicists and mathematicians have been collaborating more in the past decade than ever before. In the 1970s, physicists developed a theoretical framework that attempts to explain all of the known forces of the universe at once. Called the Standard Model, it has been incredibly successful in predicting phenomena (including the Higgs boson, the famous “God particle,” which could be responsible for all the mass of the universe) that have since been confirmed to exist. What the model does not do, however, is account for the forces of gravity or dark matter (a mysterious substance—if it even is a substance—that is thought to make up a large part of the universe). In efforts to address this and other issues, researchers have expanded on the Standard Model by inventing the principle of supersymmetry, which predicts a specific relationship between particles. But despite numerous costly experiments, that relationship has never been shown to exist. “This is a little bit of a crisis,” one mathematician said recently. Theoretical physicists tackling this problem today work with a couple of different types of theories (“supersymmetric gauge theories” and “supersymmetric quantum field theories”) that attempt to describe the connections between particles in mathematical terms. And that, says University of Toronto mathematician Joel Kamnitzer, is where the geometric Langlands Program can help (though, he concedes, “I can’t say I completely understand why”). Though it can be as abstract as pure mathematics, theoretical physics has found a much more established place in the public consciousness, in part because of its enticing visual elements and its offer of adventure. Science fiction has exposed even the most math averse to ideas about black holes, wormholes, and nth dimensions—what could be more compelling than the prospect of travelling the universe and coming back only one day older?—and enormous amounts of money are poured into investigating phenomena such as dark matter. We seem to be much more willing to face the abstract when it can fuel our imagination of the fantastical. This may explain why the outside world has been so much more interested in Langlands’s work since Frenkel came along. Theoretical physics starts with conjecture that can lead to experimentation and refinement; mathematics, on the other hand, is based on axioms and proofs, and rejects any kind of speculation. This means that “physicists and mathematicians have settled on a fine division of labour in which the former complain about the finickiness of the latter, and the latter complain about the sloppiness of the former,” theoretical physicist Sabine Hossenfelder wrote in her recent book Lost in Math. Most mathematicians working on the Langlands Program have no idea what theoretical physicists are working on, and the extent to which the Langlands Program could be useful to physics is still unknown. Langlands spent every morning, seven days a week, for five years working on the paper he delivered in Oslo. It is written entirely in Russian and dedicated in large part to reformulating the geometric program championed by Frenkel. This new paper is an attempt to shift the field toward a more traditional approach: it proposes a new mathematical basis for the geometric theory that relates more closely to Langlands’s own conjectures by using similar tools to the ones he used in the ’60s—in the process, restoring his work back to its original arithmetic purity. Before giving his talk, Langlands sent portions of the paper to various mathematicians familiar with his research. Several months later, he hasn’t heard back from anyone who’s been able to understand it in its entirety. “If he wants more people to pay attention to it,” says James Arthur, a mathematician at the University of Toronto, “why on earth would he write it in Russian?” Some people have theorized that it was targeted at Frenkel, though Langlands insists that’s not the case—he’s always wanted to write something in Russian, he says, and his retirement had finally furnished him with the opportunity to do so. If Langlands’s new work is solid, understood by enough people, and adapted into a generalization, it could be “revolutionary,” says Julia Gordon, a mathematician working at UBC. By suggesting ideas that are related to the original Langlands Program, Langlands “is trying to bring us back down to earth,” she says. His recent formulations likely won’t replace the current geometric theory—that one is “here to stay,” Arthur says—but it could become the basis for a new line of study with different potential discoveries. The day we met, he had spent his first free morning in years reading a travelogue by the nineteenth-century German writer Theodor Fontane (in its original German). Having had time to rest and visit his family in British Columbia, Langlands was more energetic and conversational than he had been in Oslo a few months earlier—and a little more forgiving of his colleagues. He admitted he should probably have been more inviting of Frenkel’s questions. In November, the Norwegian Academy of Science and Letters is co-hosting the Abel Conference in Minnesota, a three-day “mathematical celebration of Robert P. Langlands.” Langlands and Frenkel will both be in attendance. At the conference, a lecture will be presented explaining the basic premise of Langlands’s Russian paper and how it differs from the current geometric Langlands Program. Frenkel will be the one delivering it.